Sources put the output of a 60w tungsten bulb at ~800 lumen. Their commercial bulbs go upto a bit more than 300 lumen, using 7 high-powered LEDs. On that basis 20 of those? Yeah, led simply doesn't output what others do in volume, by far...but they do what they do much more efficiently. Others I've seen have WAY more than that - trouble is they lose efficacy with volume as heat becomes a problem. See attached... It shows a 180 degree bulb and a 20 degree bulb (same applies to leds as bulbs) These numbers are made up for illustration, but follow the same rules. The two bulbs put out the same total amount of light - but a tighter beam means what beam there is - is brighter. right ok. I can't really understand it then because on instructables many people have made led lights that are really bright but they haven't used as many as would be suggested if you converted it using the converter and then times it by however many needed. think of it as a container of water. a typical round bulb would be a punch bowl, and a shot glass would be a spot light. obviously if you fill the shot glass to the top it would be full and thus the spotlight would be bright, but if you poured the same shot glass into the empty punch bowl its still relatively empty. that said thees people bragging about there 10w shot glasses might think there pretty full, but it still takes a lot of them to fill a punch bowl. Yeah, I understand about that- that's a great analogy by the way. But that being the case, I'm figuring that there is no way to calculate the luminosity of LEDs when used as a spotlight, therefore no credible way of working out how many LEDs I would need to achieve a certain number of lumens. Is that correct? here is a calculator to assist with the math, just put the angle of the beam in degrees ans the candelas shown on the manufacturers site. most super bright leds i have seen out there are 12000-18000 mcd (send a link if you see some rated higher). my advise to you is to experiment. buy a solar powered garden light from walmart for $4. take the back off an old spotlight bulb that is burnt out and hollow out. tape them together. turn out the lights and see what you get. life is an RPG you cant level up unless you get some experience! Brightness is not luminosity!!! If you look into a laser pointer, you will be blinded by the BRIGHTNESS but if you shine a pointer thru a diffuser that makes it 'wide angle' its not very bright at all, because there is not a large volume of light. Those projects that show really bright stuff from only a few bulbs are using high-power leds, or are camera tricks. If you take a picture of a lit LED you'll 'blind' the camera and it looks bright. This does not mean that it is brighter than a 100 watt bulb that will also blind the camera. Next time you're in a store like wal-mart, check by the tills and they'll have led flashlights in the impulse buy section. look directly into the led - its bright all right. Shine it on something - its bright but only in that small beam. I'm not sure what you mean by good going...is that a good thing? i know that but they claim their array of leds runs at about 10 watts or watever and gives out lots of light enough to work by/ use as a spotlight. I'm sure I saw 90 watt on a single somewhere stumbling around. it was gargantuan. ...740 lumens max...not too shabs for 15 watts. 60W is equal to about 8W led spotlight of 72 super bright white led. The confusion you'll encounter in the conversion is candella (mcd) (brightness) and lumens (total volume of light output). 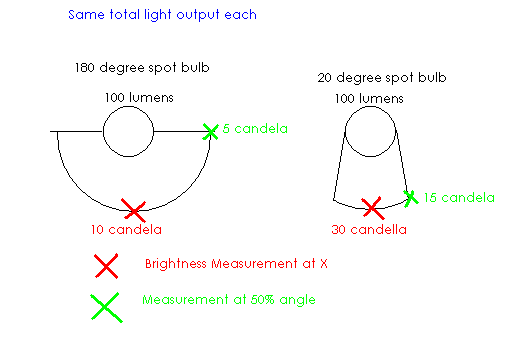 LEDs are rated in candella - in conjunction with an angle - beyond which the brightness is half of that at 0 degrees. Light bulbs are rated in lumens. A 60 watt incandescent puts out between 700-850 lumens. http://led.linear1.org/lumen.wiz will calculate the luminous intensity of your particular leds. Typical leds are 15-45 degree angle, and 'ultra bright' put out a few thousand mcd. Some stores claim in the 15candela range - but those brighter ones are simply narrower beams. ...Thats a lot of leds. your 60 watt bulb puts out ~700 lumens, spread evenly around almost all directions. To create the SAME amount of brightness, in all directions, you need 700 total lumens spread in all directions. LEDs are pretty bad a 'all directions' but do quite well at '180 degrees' beam. Again, the calculator prevails - to put out the same total amount of light you literally would need hundreds of smaller 20-30ma leds. http://www2.dealextreme.com/details.dx/sku.2394 for example puts out about 200 lumens from ONE led - they are the future of 'lighting applications'. They do cost a few bucks each however.